Hear what head coach Michael Foley and captain Matt Hodgson had to say after the 32 - 7 win over the Melbourne Rebels. Force Coach Michael Foley discusses his team to take on the Highlanders at nib Stadium tomorrow. http://www.westernforce.com.au/memberships Number 2 in the Top 10 Matches in 10 years as voted by the Sea of Blue, and what a moment this was. Attention turned to Perth as the Western Force hosted the Crusaders. Western Force Head Coach, Michael Foley, is prepared for a tough encounter against the Blues this Saturday (June 28th). He believes his team will need to be at their best as the two teams battle it out at the 'Force Field' (nib Stadium). http://www.westernforce.com.au/memberships The Top 10 Matches as voted by the Sea of Blue. Do you remember this incredible night? 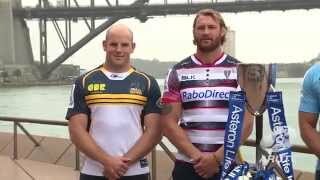 http://www.westernforce.com.au/memberships Michael Foley discusses the big match against the Brumbies this Friday, the team playing this week and the return of the Honey Badger. Belong to the Sea of Blue this season! http://www.westernforce.com.au/memberships Mitch Scott was happy with the win over the Brumbies, but says there are still things to work on for next weeks pre-season game against the Asia Pacific Dragons. http://www.westernforce.com.au/memberships Interim Western Force Captain, Sam Wykes, is looking forward to the opportunity of captaining his team, but knows that the whole team is leading with him. http://www.westernforce.com.au/memberships Western Force centre, Kyle Godwin admits that the team didn't play their best rugby but believes there are some solid positives to take away and prepare for the Waratahs in two weeks time. Western Force captain and champion player, Matt Hodgson, has signed on until the end of 2016 with an optional year to play in 2017. How great is it to have the skipper sign on?